I made these brief remarks at the Canadian Jewish Literary Awards last week. One of the inspirations for my novel was a historical figure, a pirate from a family of rabbis who came out of retirement for one last exploit: to retrieve some treasure. What was the treasure? Some Jewish books. To me, this seemed like such a perfectly Jewish way to be a pirate. In my novel, I quote a Yiddish proverb. The tongue is not in exile. No matter where Jews found themselves—when we were forced to leave our homes, through immigration or expulsion or persecution—and we had to leave often without any of our possessions—we could always bring our language: our stories, our teachings, our jokes and sayings. The tongue is not in exile. So wherever we went, we brought ourselves with us. I don’t know if language is our shadow or if we are language’s shadow, but to me to be a Jew is to believe in language and to believe in books. 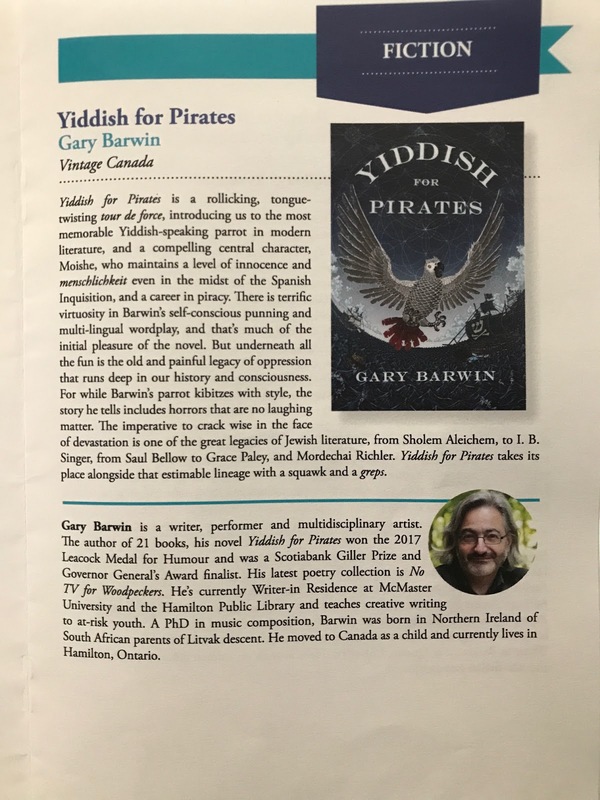 So it is a very special honour to receive this recognition from the Canadian Jewish Literary Awards. Thank you to the clearly very wise jury and to everyone else involved in organizing. I’m really very honoured. And congratulations to my fellow award winners, and especially my old friend Stuart Ross. It’s a thrill to be here with him. We’ve been friends and writing colleagues for about 35 years. And thank you to my family, for making the book—and everything else— possible: my wife Beth, my parents, in-laws and my kids. And you know that old joke which asks, “so when is a Jewish fetus viable?” So, when is a Jewish fetus viable? After it graduates from Law or Medical school. But now I’m hoping that winning this award has finally made me viable. Very happy to have an essay published in the Hamilton Literary Review, a great online publication that comes out of Hamilton, Ontario (where I live) created by an editorial board of excellent Hamilton writers. However, I would like to take this opportunity... to thank those who have never bought or never heard of my books — all those on this planet and all those lifeforms extant in other places of the present, past, and all possible universes. 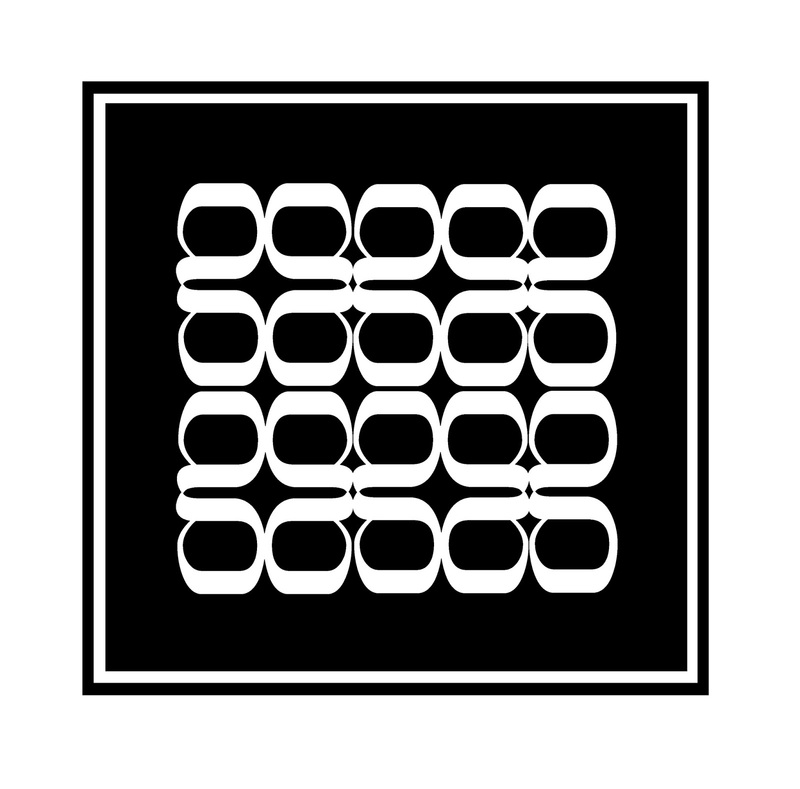 You help make my books mysterious, unknown, a sanctuary for initiates and cognoscenti. You maintain the notion of my books as places of infinite possibility, as thought-and-feeling machines of limitless potential energy. You make special dogs of those who have dog-eared my work, those who have actually read it. His entire blog looks fascinating and has excellent discussions and interviews. 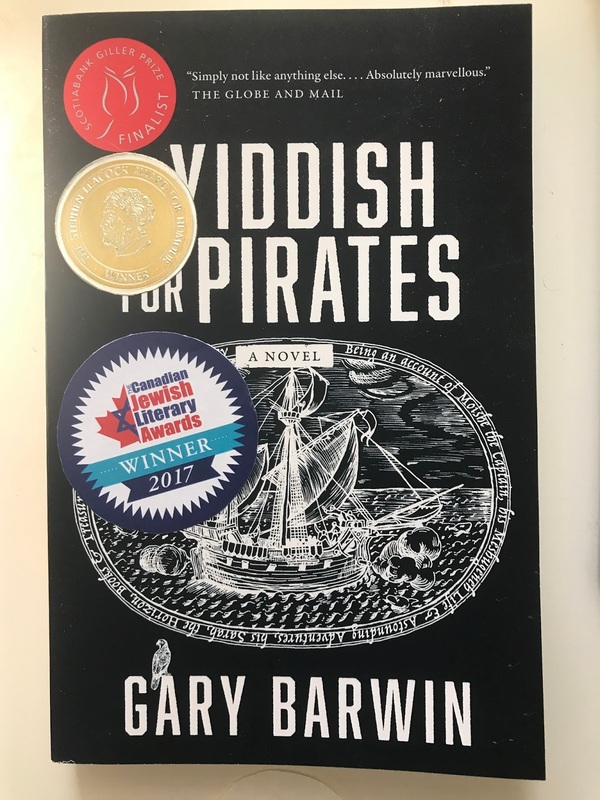 Canadian Jewish Literary Award for Yiddish for Pirates. Samekh, from my ongoing Hebrew letter palindrome series. If you’re looking for a tale of love, adventure, courage and friendship, “X” marks the spot. You won’t read anything else like it. 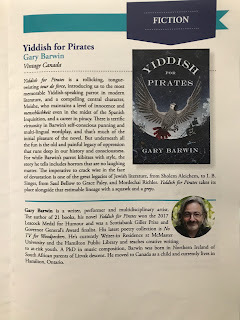 I'm very happy to have this first US review of Yiddish for Pirates which appears in the Philadelphia-based Jewish Exponent since the novel is now available as an audiobook and as a paperback in the good ol' U. S. of Merika. 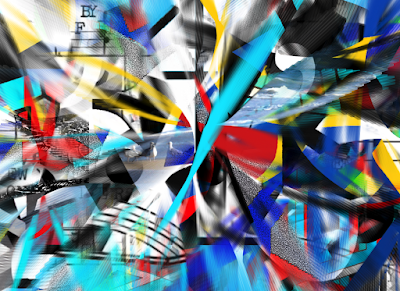 Image from Jim Andrews' Aleph Null program using some of my visual work as material for the "brush"
It's been a while since I've posted here. I became Chancellor of the Exchequer of a land inhabited by small clowns. I've begun as writer-in-residence at McMaster University and the Hamilton Public Library. It's been fascinating. I've met with a wide range of people already, from the quite young to the more senior, from someone who wanted help with a book on the finer points of kimono collecting to a science fiction writer who was going to write to one of Donald Trump's sons to ask where to publish. I find it inspiring to read work outside my usual range and to try to think about how I can best offer advice, information, or inspiration. I've read some knock-out poetry and some very vivid memoirs. 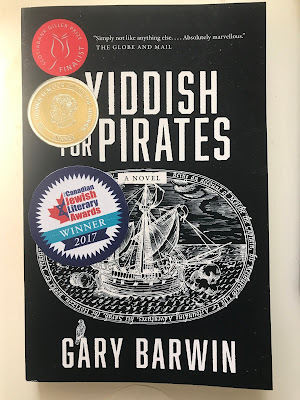 Yiddish for Pirates has won the Canadian Jewish Literary Award for Fiction—and my good friend, Stuart Ross's book A Sparrow Came Down Resplendent (Wolsak and Wynn) won for Poetry. Yiddish for Pirates is now available in the US! And there's a Canadian audiobook version as well as the US version. They have different actors reading. It's fascinating—at least for me—to compare. I did some readings in Vancouver (The Real Vancouver Writers Series) and in Sidney by the Sea (on Vancouver Island) for the Sidney Literary Festival. Poems, poems with computer music accompaniment, and readings from Yiddish for Pirates. AND....I'm beginning work in earnest on my new novel which is turning out to be some kind of Western set in Eastern Europe. I'm considering posting a word count on the door of my McMaster University office just to shame myself into keeping writing. We'll see if I'm brave enough. Finally, I didn't really become Chancellor of the Exchequer of that land inhabited by small clowns. I didn't have the shoes. Or the hat. 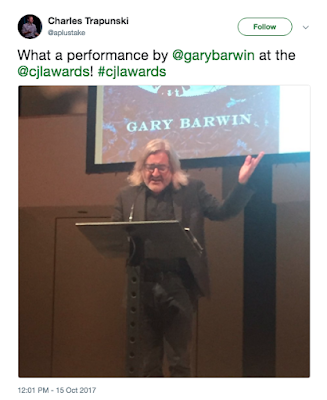 all content, (c) Gary Barwin, or otherwise, by its creators. To steal is to forget. To forget is a blade nothing like darkness.